The 2016 election ushered in a new era in Washington defined by unified Republican control of the White House and both chambers of Congress. The changes in the dynamics of power in Washington have registered with members of both political parties. Somewhat more Republicans express trust in government today than did so prior to the election, while views among Democrats have moved in the opposite direction. For the first time since George W. Bush’s presidency, Republicans (28%) are more likely than Democrats (15%) to say they can trust the government in Washington to do the right thing just about always or most of the time. The share of Democrats expressing trust in government is among the lowest levels for members of the party dating back nearly six decades. The national survey by Pew Research Center, conducted April 5-11 among 1,501 adults, finds that the overall level of trust in government remains near historic lows; just 20% say they trust the government to do what’s right always or most of the time. Far more say they trust the government only some of the time (68%); 11% volunteer that they never trust the government to do what’s right. As was the case prior to last fall’s election, the public’s feelings about government tend more toward frustration than anger. Most Americans (55%) continue to say they are frustrated with the federal government, while relatively few say they are either angry (22%) or basically content (19%). On both measures of trust in government and emotional reactions to government, improving views among Republicans and Republican-leaning independents have been offset by more negative views among Democrats and Democratic-leaning independents, resulting in overall assessments that are little different than in previous years. There also has been a substantial change in partisan attitudes regarding the country’s future. Overall, 41% of Americans say they have “quite a lot” of confidence in the future of the U.S., while 30% have some confidence. About a quarter (28%) say they have little or no confidence in the country’s future, up from just 15% in the fall of 2015. Since then, the share of Republicans expressing quite a lot of confidence in the nation’s future has increased 19 percentage points (from 40% to 59%), while falling 22 points among Democrats (50% to 28%). Public trust in government is little different that it was before the 2016 election. In October 2015, 19% said they felt they could trust the government in Washington to do what’s right always (3%) or most of the time (16%). No more than about 30% have expressed trust in the government in Washington to do the right thing at any point over the last decade. This marks the longest period of low trust in government since the question was first asked in 1958. Trust in government has typically been higher among those associated with the party in control of the White House than among those who support the opposing party. This is true today as Republicans and Republican-leaning independents are now more likely than Democrats and Democratic leaners to say they trust the federal government to do what is right always or most of the time (28% vs. 15%, respectively). Trust in government among Republicans has increased 17 points since October 2015. The current share of Republicans who say they trust the government at least most of the time (28%) is considerably higher than throughout much of the Obama administration and is on par with the share of Republicans who said this in 2007 and 2008. Still, GOP trust in government today remains significantly lower than it was throughout most of George W. Bush’s administration. 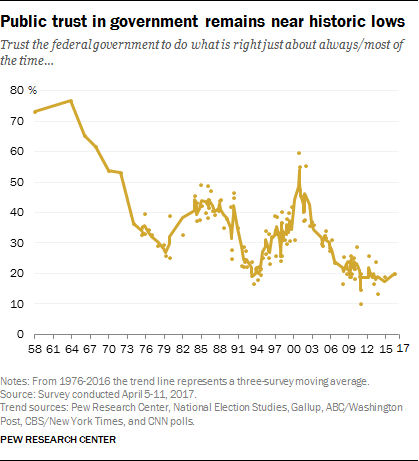 While Republicans’ trust in government has increased substantially over the last several months, Democratic trust in government is now as low as it has ever been in 60 years. Just 15% of Democrats say they trust the government in Washington to do what is right always or most of the time, a decrease of 11 percentage points since fall 2015. (See the accompanying interactive for long-term trends on public trust in government, including among partisan and demographic groups). The public continues to express frustration with the federal government, rather than anger or contentment. A majority of Americans say frustration (55%) best describes their feeling toward the federal government, while about two-in-ten say they are angry (22%); a similar share (19%) say they are basically content. Overall, attitudes toward the federal government today are virtually identical to a year ago. In March 2016, 57% said they felt frustrated with the federal government, while 21% said they were angry and 20% said they were basically content. The current level of anger toward the federal government is about the same as it has been over the last few years and lower than it was in October 2013, during the 16-day government shutdown. At that time, 30% said they were angry at the government. Today, Republicans (21%) and Democrats (24%) are about equally likely to express anger about the federal government. 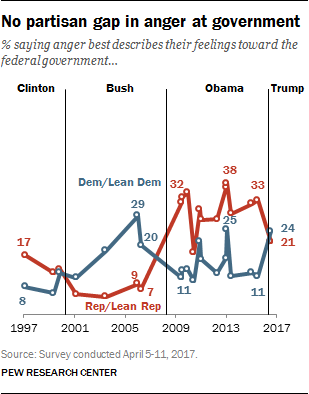 This reflects substantial shifts within both parties over the last year: Levels of anger toward the federal government have fallen sharply among Republicans, while levels among Democrats are up significantly. Among Republicans and Republican-leaning independents the share feeling angry toward the federal government is down 12 percentage points from March 2016 (from 33% to 21%). The last time anger toward government was about this low among Republicans was in March 2011 (18%), shortly after Republicans regained control of Congress following victories in the 2010 midterm elections. Still, Republicans are more likely to express anger at government today than they were during the Bush administration. By contrast, Democrats and Democratic-leaning independents are about twice as likely to express anger toward the federal government than they were a year ago (11% then, 24% today). The only time during the Obama administration that levels of Democratic anger were about as high as they are now was in October 2013, during the federal government shutdown, when 25% said they were angry. 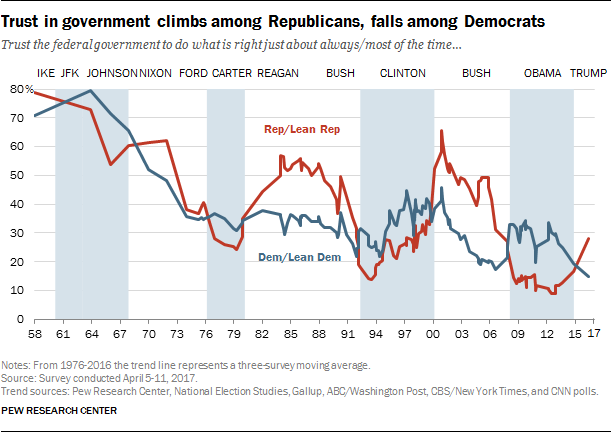 Democratic anger at government was at similar levels during Bush’s second term. The public’s overall outlook for the nation remains more optimistic than pessimistic, though a smaller share express confidence in the country’s future than did so in the fall of 2015. Overall, 41% say they have quite a lot of confidence in the future of the U.S., while another 30% say they have some confidence. About three-in-ten (28%) say they have very little or no confidence at all in the future of the U.S. The share with at least some confidence in the future of the country is down 13 percentage points from 2015 (from 84% to 71%). Over the same period of time, the share saying they have very little or no confidence in the country’s future has increased from 15% to 28%. As with views of government, attitudes among Republicans and Democrats have moved in opposite directions following the election of Donald Trump. Fully 59% of Republicans and Republican leaners now say they have quite a lot of confidence in the country’s future and 22% say they have some confidence; just 18% say they have little or none. The share with a lot of confidence in the country’s future is up 19 points from 2015, when about as many Republicans said they had a lot (40%) as some (42%) confidence in the country’s future. Democrats express much less confidence in the future of the country today than in 2015. 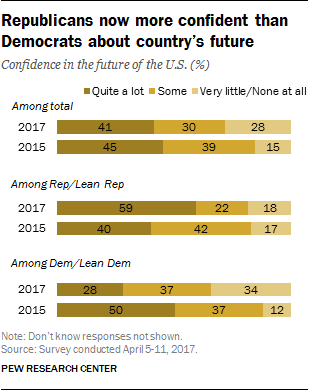 Currently, just 28% of Democrats and Democratic leaners say they have quite a lot of confidence in the country’s future, down from 50% in 2015. And while 34% of Democrats now say they have little or no confidence in the nation’s future, just 12% said this a year and a half ago. Differences in views of the country’s future vary across demographic groups. Men are almost twice as likely as women to have a lot of confidence in the future of the U.S. today (53% vs. 29%). This 24-point gender gap is far wider than it was in 2015, when there was little difference in views between men and women on this question. Younger adults are less optimistic about the nation’s future than older Americans. Nearly half of those 50 and older (48%) express a lot of confidence in the future of the nation, while only about a third of adults under 50 (35%) say the same. Currently, there are modest differences in outlook by levels of educational attainment. Those with some college experience are somewhat less likely to say they have a lot of confidence in the future of the U.S. than are both those with more and less education. The shares who say they have a lot of confidence are down significantly since 2015 among postgraduates (13 points), college graduates (8 points) and those with some college experience (7 points). There has been no significant shift in outlook among those with no more than a high school diploma. By 66% t0 30% more Americans say they are dissatisfied than satisfied with the way things are going in the country today. 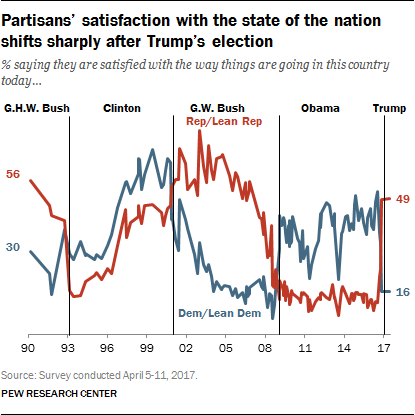 Overall satisfaction with the state of the nation has changed little over the last several years, but there has been a stark shift in these views among partisans. Currently about half of Republicans (49%) say they are satisfied with the state of the nation. Though this is unchanged since February, it is up from 24% in January and 11% in late October, a few weeks before the 2016 election. Throughout the course of Barack Obama’s presidency, no more than about two-in-ten Republicans expressed satisfaction with the way things were going in the country. By contrast, Democrats’ satisfaction with the country has plummeted following the election: Just 16% of Democrats and Democratic leaners say they are satisfied with the way things are going today. This is down from 33% in January and 52% in October. While it is typical for partisan views of the country’s direction to shift following a change in party control of the presidency, the size of the shift among both Democrats and Republicans is more pronounced today than it was in either 2001 (when GOP views grew more positive and Democratic views more negative after the transition from Clinton to Bush) or in 2008 (when Democratic views became more positive and Republican views more negative at the beginning of the Obama administration).